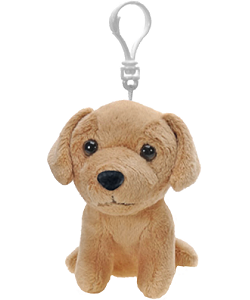 This adorable Golden Retriever puppy plush backpack clip stuffed animal is the perfect take-along pal. With a huggable body of soft tan fur, a black nose, and warm brown eyes, this plush Golden Retriever stuffed animal is just as happy as can be whether he is simply sitting and hanging out with you or the two of you are trekking far and wide in an on-the-go imaginative adventure. 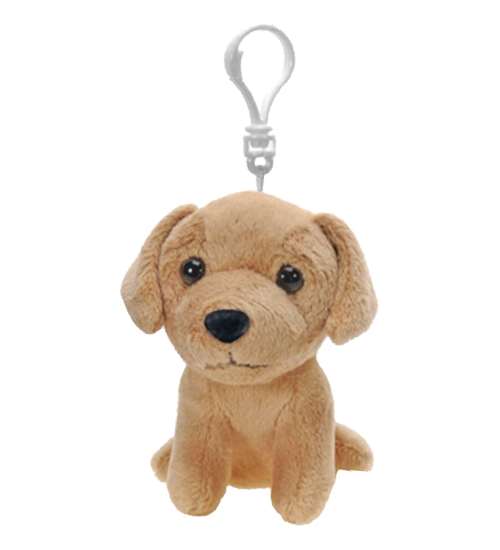 Complete with white backpack clip for attaching to your backpack, purse, belt loop, or simply looped around your finger, this plush Golden Retriever clip on critter is also great for birthday treat bags, prizes, and giveaways. This adorable plush Pug has a huggable body of soft cream fur, black accents, and white clip. This cute plush Scottish Terrier is sweet and huggable with soft gray fur, fluffy accents, and white clip. This adorable plush black lab has a huggable body of soft black fur, warm brown eyes, and white clip. This adorable Huggers plush yellow lab has soft golden fur, a smiling face, and plush-covered snap bracelet arms.